This weekend I was in the lovely city of Norwich visiting my half sister Krissy, her partner Tim and my nephew Leo, and on Sunday we went into the city center for a wander and some lunch. After talking to my line manager (Bianca) at work about my planned weekend in Norwich with family, she told me about a magical Waffle House that I should visit. Krissy & co have only lived there for a little while and had never heard of this place, let alone ventured to this area of town and Bianca actually mentioned how amazing this place was more than once, so I knew we couldn’t miss out… And boy did it not disappoint! 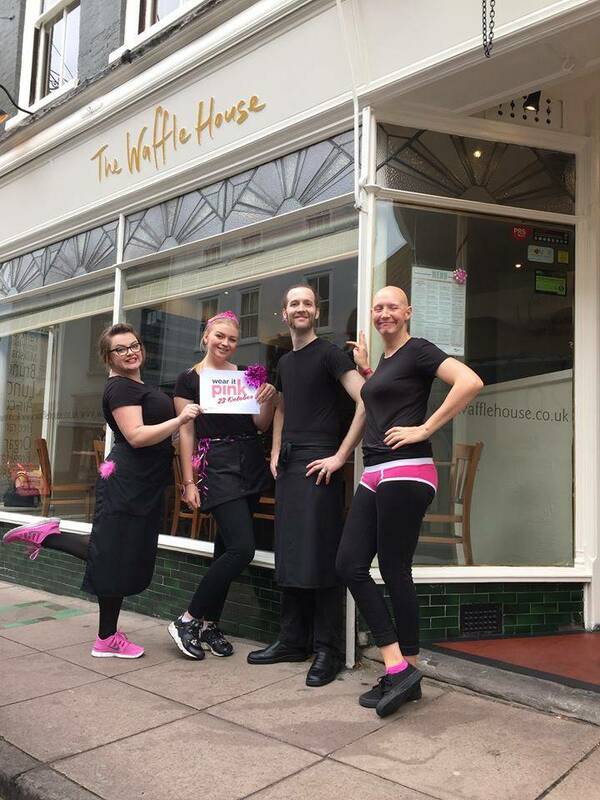 Waffle House Norwich Team on 23rd October for #wearitpink. The Waffle House is set in a Georgian, Grade 2 listed building and has been open since 1978. All the ingredients are free range, organic and fresh – avoiding food containing preservatives and colourings. The whole wheat and white flour used in the waffles are both organically grown too! They also provide a selection of organic beers and ethically sources wines, as well as fresh fruit milkshakes and an extensive range of fair trade coffee. We arrived at around 12.30 and it was already pretty busy, there were 2 groups of people queuing in front of us – but luckily it didn’t take long for us to be seated. 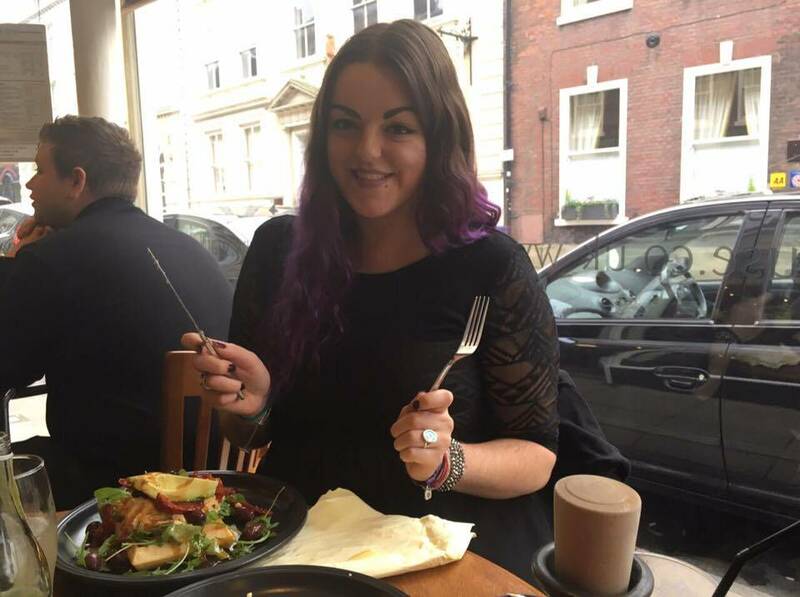 The staff were all very smiley and friendly and we were sat on a lovely, bright table right by the window. I was completely overwhelmed with the menu choices, but two that really caught my eye included Indian inspired waffle “Potato, Cauliflower, Spinach & Puy Lentil Dhal” and “Authentic Greek Salad” (which my sister ended up getting). however after much deliberation I chose the hummus and avocado waffle, with a garlic butter, cheese and rosemary “side” dish. When the food arrived we were absolutely blown away. 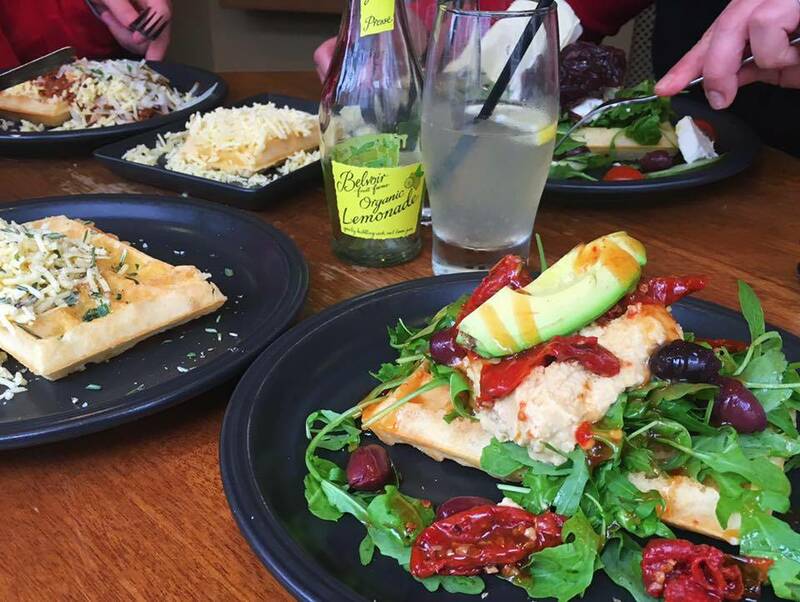 Leo had a Bolognaise waffle, Krissy the ‘Authentic Greek Salad’ waffle (which included caramelised onions and lots of crumbled feta) and I had the ‘Hummus & Avocado’ Waffle with fresh rocket, sundried tomatoes, olives and sweet chilli dressing. I forgot to check if the hummus was homemade, but I like to think it possibly was considering they make most of their ingredients from scratch. 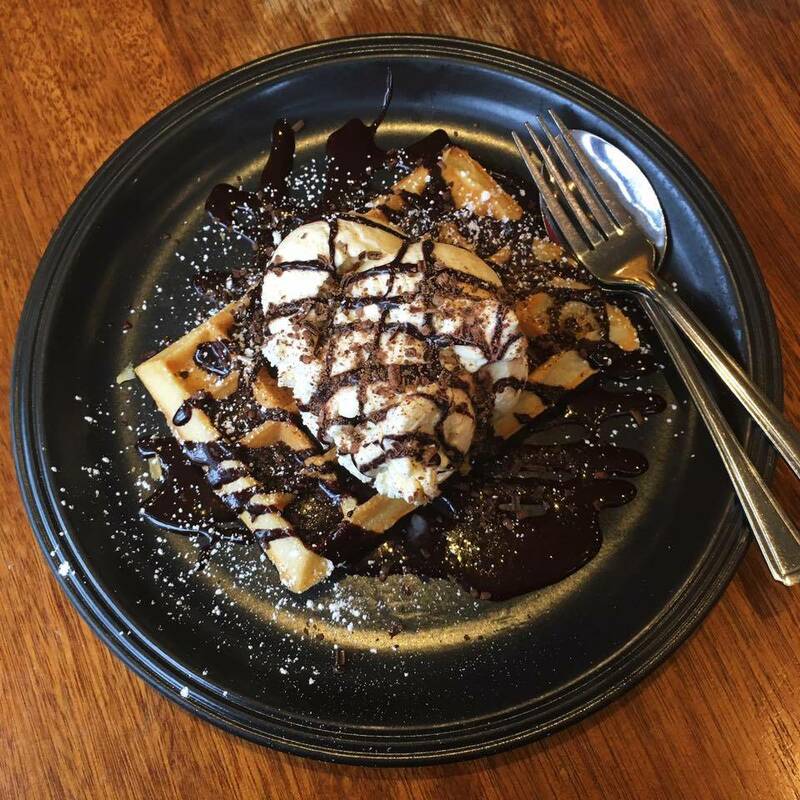 Initially I wanted the ‘Chocolate Mousse Waffle’, but after checking, unfortunately the mousse wasn’t vegetarian, so I opted for a tailor made, not on the menu: vanilla ice cream, chocolate sauce and chocolate flakes… Simple, but extravagant as you like. My stance on this was: if I’m going to have a mega treat meal, I may aswell go all out… Right? Right! It tasted absolutely divine and although I was pretty stuffed from main I was adamant I would appreciate the dessert in full – no need for dinner when I got back to London on Sunday evening! With both mains and desserts there was the option to get a “small” or large one… I put “small” in bunny ears because they were actually giant. If I’d have got a large main I would most definitely have been rolling back to the car and unable to move for a few hours! Overall I could not recommend this place enough. If you’re hungry in Norwich and want to have a naughty meal, then why not head to the Waffle House at treat yourself? The restaurant is less than 10 minutes from the main central shopping area and very near Norwich market! 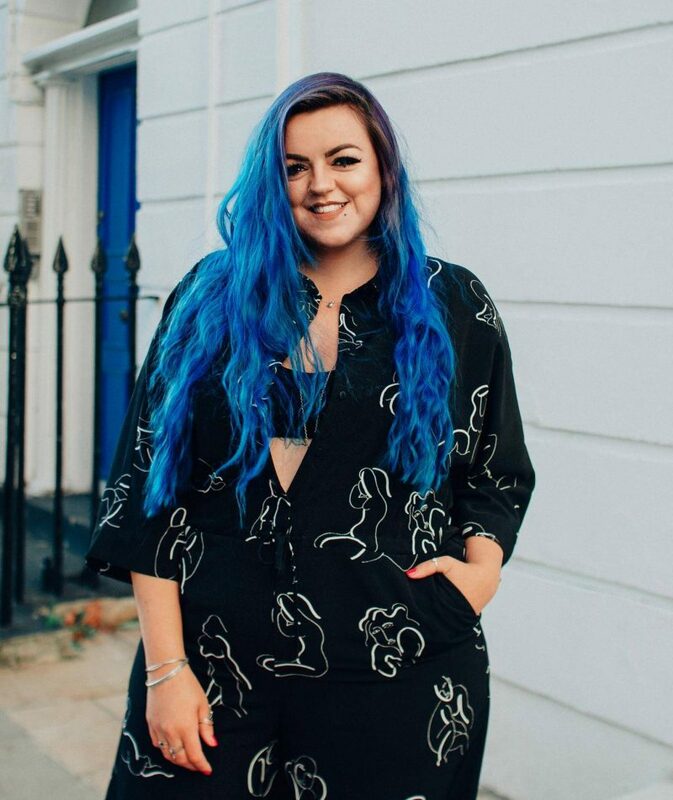 My sense of direction is pretty pants (I’m usually the kind of person that walks into a shop and then when leaving, walks back the same way I just came), so if I can find it… You can! 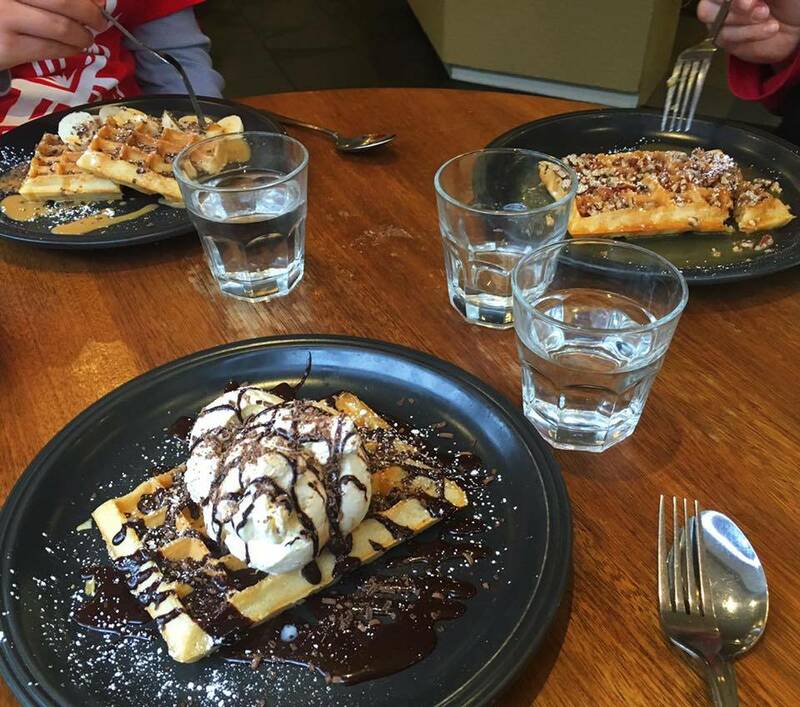 After raving about this on social media I found out quite a few friends love this place too and the one in St Albans is just as good, so if you’re in that area or around London and fancy yourself some wonderful waffles, make sure you check it out!